Just in time for the arrival of the new truck itself, we’ve finally received details regarding the 2018 Toyota Tacoma in Edmonton AB. The Tacoma is a legendary pickup truck on the market, one of the longest-lasting midsize trucks still on the market. While many of today’s popular midsize trucks have returned after a hiatus – like the Colorado, Ridgeline, and upcoming Ranger – the Tacoma never went anywhere. Only a few updates came to the Tacoma this year, but even those small improvements help to reaffirm the 2018 Tacoma as one of the best options in the overall truck class on the market. The improvements include leather seats for the TRD Sport upgrade package, a completely new trim level, and the standardization of the Toyota Safety Sense P package – the last of which is obviously the most exciting and important. The 2018 Toyota Tacoma delivers everything that’s expected of a pickup truck of its size, plus even more. The inclusion of the TSS-P package makes it one of the safest pickups on the market, thanks to collision-avoidance technologies like the Pre-Collision System and Automatic High Beams. Its cabin is spacious, comfortable, and filled with similar features to what you might find in a sedan or crossover. But that doesn’t mean it skimps in the important areas. Its multiple engine options offer a range of different performance specifications and capability ratings, all of which impress. Furthermore, there are a multitude of different models, packages, and trim levels for you to choose from, further ensuring that you’ll be getting the perfect pickup truck to meet your specific needs. If you’re interested in finding out more specific information about the 2018 Toyota Tacoma, be sure to get in touch with us here at Toyota on the Trail or simply search around our website and blog for the info you need. 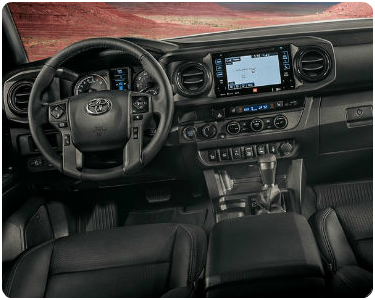 If you think the Tacoma is the right truck for you, schedule a test drive right here on our website so we can get you in the driver’s seat as soon as you’re ready.